Most municipalities require UL listed or FM Global approved backflow preventers on the incoming water line feeding fire protection systems. A backflow preventer does just what the name implies, it prevents water from the fire system from flowing back into the water system. 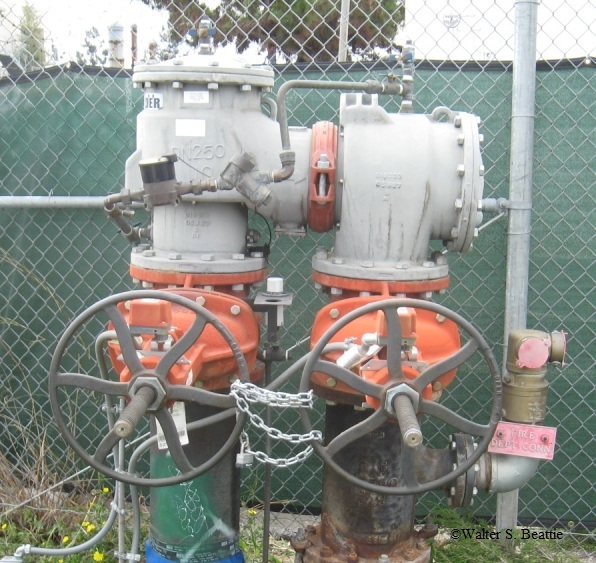 Backflow preventers may be created in a number of ways. One way is to install a fire pump and water storage tank. The tank has a float valve which opens a fill valve on the public water supply. The water flows like a faucet into a bathtub, and the water passes through the air before filling the tank. When the tank is full, the float shuts the valve and the flow of water from the public water supply. The public water fill pipe is above the level of the water, so once the flow of water stops, there is no way to flow back into the system. This system is referred to as an air break. Single wing-check valves have been used for a hundred years as a means to prevent backflow. Unfortunately, a simple check valve is not leak proof, and conditions were found where the single check valve was allowing water to back up into the public system. 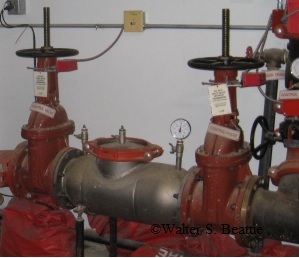 Then double swing-check valves were used, doubling the reliability of backflow prevention. An improvement in the swing-check valve was the addition of weight inside the valve body and hung on the downstream face of the check valve. The additional weight prevented the swing check from floating open and allowing seepage backwards through the valve and into the public side of the piping. A down side to the design of many older check valves is the inability to actually test the valves to verify that the valves are seating positively. Today, the design of the check valves for fire systems has improved significantly. Many newer backflow prevention check valve assemblies do not rely on a swing check system. They use a more sophisticated spring loaded system in which the seat moves perpendicular to the valve seat. Other valves which are of the swing design have a spring loaded cam arm to maintain positive seating force against the top of the clapper. Most valves have means of testing the valves to verify that the seats are definitely holding. Most of the valves available today are on an angled seat that create a greater differential over the face of the clapper to help hold the valve closed. Many are weighted or spring loaded. Reduced pressure zone valves are considered more reliable at backflow prevention. The assembly has two check valves in series. The volume between the check valves is monitored for pressure differential. If the differential is not great enough, water from the section between the valves will discharge to create a greater differential pressure. Constant or frequent discharge from the differential drain may indicate that the check valve seat is not holding and allowing water to flow backwards into the reduced pressure zone of the valve. These devices must be maintained and tested on an annual basis. This inspection is usually accomplished by shutting the valves on both side of the assembly. The housing is opened and the clappers removed. Some styles have an access port which is held closed by a rubber gasket and flanges that are paired to create a full circle around the gasket and lid and are bolted together. There may be a screw type housing for the clappers. The clapper assemblies are unscrewed from the seat housing and removed from the maintenance port. The spring or spring loaded cam arm is disarmed, the clapper is cleaned, inspected, and tested. The manufacturers specifications must be closely followed, and most municipalities require the servicing technician to be trained, certified, and sometimes licensed. For more information and to actually see videos on how the assemblies work, are disassembled and reassembled, and maintained, look on the manufacturers’ websites. Watts Water Technologies, Inc. is one company that provides videos of the inner workings of the devices. Watts is the owner of Watts, Ames, Mueller, Febco, and other brands very familiar to those in the fire protection field. The major disadvantage of backflow prevention devices is the additional friction loss. The head loss as a result of water friction loss is substantial and becomes greater as the flow increases. 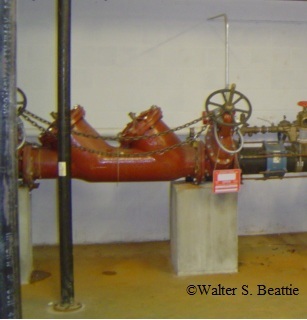 If a backflow preventer is added to a fire protection system which was not originally designed for one, the friction losses across the backflow preventer assembly may be so great as to make the sprinkler system(s) inadequately supplied with pressure and volume. This entry was posted on Sunday, January 29th, 2012 at 10:40 pm and is filed under Uncategorized. You can follow any responses to this entry through the RSS 2.0 feed. You can leave a response, or trackback from your own site.